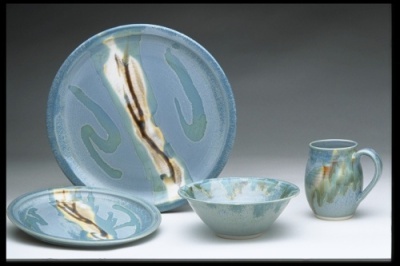 Carol Temkin is a studio potter specializing in decorative, functional, hand-thrown porcelain. She has exhibited her work in leading galleries throughout the United States. Her work has also been featured in published articles in the popular press and in recent books. Her throwing techniques are described and illustrated in the widely used college textbook Hands in Clay, by Charlotte Speight and John Toki (McGraw Hill). A professional biography accompanied by color photographs of her dinnerware and a teapot appear in The Potter’s Professional Handbook by Steven Branfman (Krause). Carol’s porcelain is characterized by its delicate, graceful forms. She uses deep, rich, colorful glazes in shades of turquoise, lavender, blue and black, with strong brilliant accents. 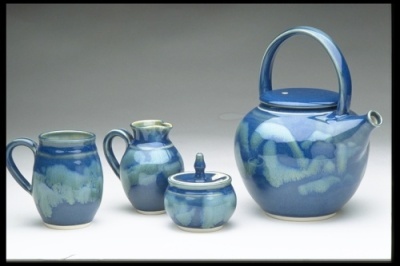 Many of these glaze effects were developed by her in her studio and are unique to her work. Carol believes that “Functional pottery combines a visual-aesthetic experience with a physical-sensual one.” She believes that art should have a place in everyday life. Using an individually hand-crafted piece of functional pottery integrates art and everyday life, bringing a special beauty to our ordinary existence. Carol currently works in a fully-equipped studio located at her home in Needham. Prior to that, she worked as a teacher and potter at the Potters Shop and School in Needham. For more than two decades, she served as Director of The Potters School, where she created the children’s educational program, taught adult classes and oversaw the schools operation.